The comp that I used when querying was Sara Zarr’s Story of A Girl and I think that still holds true. 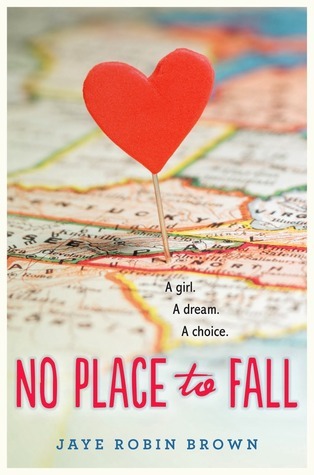 No Place To Fall is kind of gritty at times and Amber’s life isn’t easy. Some authors who I admire in contemporary are Nina LaCour, Sarah Dessen, Holly Cupala, Robin Constantine, and Emery Lord, to name a few. I would think if readers like contemporary, these might work. How long did you work on NO PLACE TO FALL? I’m a consistent drafter, and first drafts typically take me between 8-10 weeks. I write almost every morning for an hour or so and manage to get in, on average, 7k words per week. Then I usually go through one revision on my own, call in my first line reader, then revise as she reads, then on to a beta read or two, and now that I’m agented/editor’ed, on to one of the two of them. I probably wrote/revised the draft of No Place To Fall that my agent signed, in about 9 months. Then my editor and I worked on it for another six months before it went on to fun things like copy edits and first pass pages. I realize that’s not a compartmentalized time line, but publishing doesn’t really work like that. That I’m more tenacious than I realized. I had a couple of pretty major revisions and though it would have been easy to curl into a ball and stay that way, I didn’t. I pulled myself up (after a weekend of horse back riding and forgetting about it) and got to work. And miraculously? I managed to make it through! What do you hope readers will take away from NO PLACE TO FALL? That small-town girls from Appalachia have dreams as big as anyone else. And just because your family screws up, or you screw up, it doesn’t have to mark your future actions and choices. Oh. And that banjo players can be super cute! One of the biggest things we can do as writers is continue to live our lives. It’s hard to bring anything to your stories if your entire worldview is the bright screen of a laptop. Get out. Have fun. Take classes unrelated to writing. One of the best things in my life was a couple of years when a group of my friends had a sort of challenge. We would search for the most interesting and unusual places and experiences to share with each other. It got us off our beaten paths and into parts of our surroundings we might not otherwise have experienced. All of that stuff is great fodder for storytelling! Jaye Robin Brown, Jro to her friends, lives on a fourteen acre farm in the mountains north of Asheville, North Carolina. She is fond of dogs, horses, the absurd and the ironic. She truly believes laughter and music are the best medicine. When not writing you can find her in the art room of the high school where she teaches.